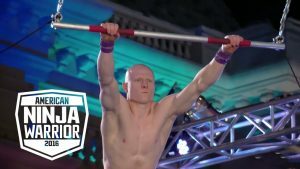 American Ninja Warrior” Kevin Bull has struck a deal the obstacle builder brand CircusTrix recently. The CEO of the company is excited to have Bull on board, as he demonstrated extreme talent and adversity during the crazy obstacle course that was built specifically for American Ninja Warrior. The very challenging course made many men succumb to their knees at the finish line, and has opened up more doors for its participating athletes due to its growing popularity. CircusTrix will be advertising its products more frequently over radio commercials and television ads, and they are thrilled that Bull will help them build the name of the brand by being their face. Bull is a extreme recreation center bodybuilder that is easily recognized for his sleek bald head and very well defined muscles, which no doubt helped him excel during the American Ninja Warrior competition. By representing the CIrcusTrix brand, the athlete is helping to not only move things forward for himself, but an entire community of others who do the same type of career as he does. This deal will serve as a business model for what will hopefully be in place for other athletes who would like to represent a brand or company like CircusTrix. This is especially meaningful since the American Ninja Warrior event does not pay its athletes, so this might be a great way for them to pave their way to getting a sponsorship, too. Bull has been announced as the latest face for the CIrcusTrix obstacle course equipment brand. He hopes not only to build himself a nice side career in the media, but to help fellow athletes like himself find a way to get their names out there while helping another business as well. If your company is interested in finding out availability and booking fees for a professional extreme athlete like Kevin Bull or other sports celebrities for an Product Promotion, Charity Event, Guest Appearance, or Autograph Signing Session, call us at 1-888-246-7141.